The first thing I did was grab the frame and try and loose as many screws and bits on the floor as possible. I was assisted in this by Joss (20 months old and into everything) who was curious what nylon screws tasted like and if they would assist digestion. After retiring to a more secure location I then did a quick fit build of the frame to see how it all went together. There are instructions on the Blackout site to follow and it is not rocket science. I didn't tighten anything as at this point I was not sure what order I was going to do things. Getting power to the power distribution board (PDB) seemed like a good starting point. I placed the battery on top where just about everyone seems to mount them in the photos, connected the male XT60 connector and tried not to short it out on anything. I then worked out roughly how long to make the male end of the connector, disconnected it from the battery, trimmed, stripped and tinned the ends. I then tinned the connections on the PDB with a little help from a trusty flux pen and soldered the connector on. There are two spare holes in the PDB either side of the power pads and I looped a small cable tie through here and over the leads just to add a little extra security. It may do nothing but it made me feel better. Connecting up the battery lights up all the LEDs on the PDB so I could confirm that all was well at that end. I now also had something bright to chase Joss around the house with while making aeroplane noises which he loved no end. Now as warned, there is a good bit of hacking involved in this build and it started here. To reduce weight and make everything fit, the motor wires on the ESC need to be trimmed and the Motor wires also need to be shortened. On the ESCs I removed the heatshrink and cut the wires off at about 6mm long. I later re-did these to about 3mm long to give me even more space so please ignore the photo other than for the idea of what was being done. The three wires were then tinned. ESC after trimming and tinning but still too long. I then mounted the motor to work out how much I was going to shorten those leads. I wanted to put a loop in them for stress relief and found that from the motor to the frame would be about right. I then cut, trimmed and tinned these three. Now since you need two clockwise and two anti-clockwise motors you need a wiring strategy that will prevent you having to re-solder things. To reverse the rotation of a motor you need to swap any two of the leads between the motor and ESC. Therefore I laid all the ESCs down the same way opposite their motors and connected two of them up with the wires exactly as the wires lay. On the other two I simply crossed two of the wires so that I would have two motors that would rotate one way and two that would rotate the other. ESC and motor wired up - this is a twisted set. I then applied liquid electrical tape to the joins and finally new 20mm clear heatshrink to protect it all. 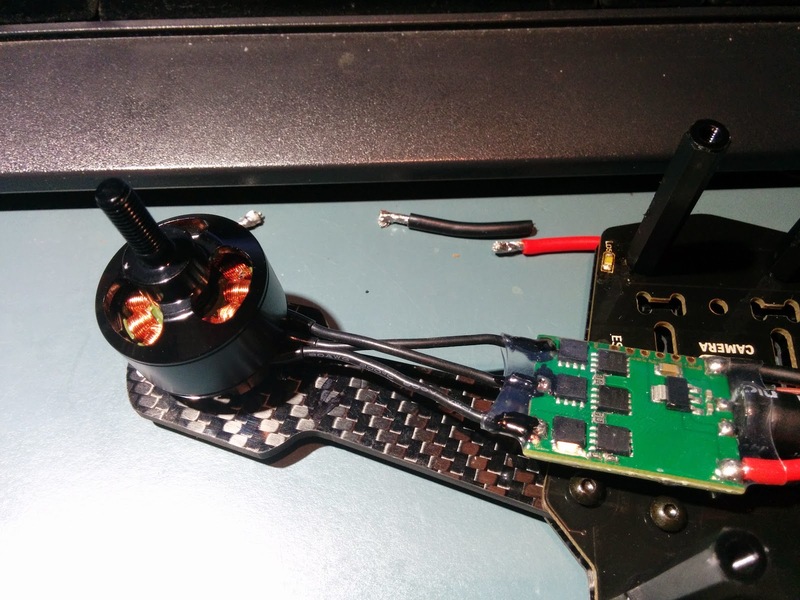 In order to test the motor rotation I needed to get power to the ESC and a signal to the ESC to tell it to spin. The only way I could think to safely do this (read: without blowing things up) was through the flight controller so it was time to get that side of things ready before I could do anymore. I did not want to bolt all the motors down and solder the ESCs to the PDB only to have to move everything later on. This makes part 1 of testing motors really boring as I basically pushed it all to the side and got on with the next part of the build. The Naze32 as mentioned previously, comes without all the pins soldered on so you need to get that sorted before anything else. I could go through and write up what I did but the reality is that I followed this YouTube video and it all just worked. I have not done a lot of this sort of soldering but safe to say that flux, helping hands to grip things and a nice fine soldering iron are a must. With the flight controller ready to go I then needed to power it up so that I could play with the motors though the PC using the Baseflight configuration tool. Note, Baseflight is being updated all the time so these screen captures are almost definitely out of date so consider this a rough guide only. This will be used to do all the set up of your Naze32. There are other options but this is what I used and it works perfectly as far as I can tell. My PC here is a Windows 7, 64bit workstation which on connection of the USB lead to the FC drew a nice useful blank and could not find or install drivers. Plug the Naze32 into the PC with a micro USB cable, fire up the Baseflight app, pick the COM port allocated to the Naze, connect and you are now live and ready to play. Well, almost ready. Chances are you will be told that you need to do a firmware update on the Naze32 board before Baseflight will let you set anything up. To access the firmware flasher in Baseflight you first need to click "disconnect" from the PC to get to the welcome window with the firmware flasher button located on the bottom right. Use the button up the top or just unplug the USB cable. I just left everything unchecked, clicked on "Load Firmware Online" which goes looking on GitHub for the latest firmware, downloads it and shows you the details once it is ready. Make sure the Naze32 is plugged in and click "Flash Firmware" to do the job. A nice green bar at the top when it is done and you are ready to move on. Now your firmware is up to date, click connect and have a look around. The Naze32 will be powered by the USB connection and you will have a nice graphic showing you the movements the board is making in real time. There is a lot of good reading out there to understand the evolution of these boards and how the accelerometers and gyros work together to identify what your quad is doing but you can also just look at the pretty pictures and see the output from the "Raw Sensor Data" tab and know that it is magic carved from silicon and unicorn dust. Go to the "Configuration" tab in Baseflight and you can now select the type of motor layout. This is a MiniH but the motor layout equates to a QuadX - ie: who cares where the arms are, it is the motor positions that will determine how it is controlled. When you make changes you need to hit "Save" down on the bottom right. The board will do a quick reboot and you are good to move on. Forget to hit save and settings you thought you made, well, won't be. So now I had the flight controller hooked up I needed to get power to the motors and see which ones would spin which way so I could lay them out on the quad once and once only. The first job was to understand how power moves around in this thing. 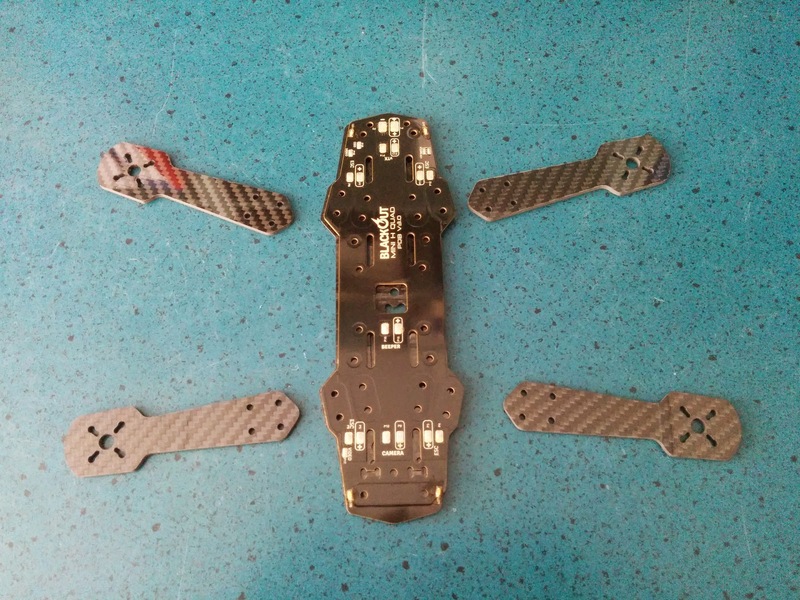 1) Power from the battery is supplied to all four ESCs via the PDB that makes up part of the frame. 2) The ESCs have a BEC connection which stands for Battery Elimination Circuit. The BEC does two things, it supplies power to the flight controller and in the case of an RC plane, it would stop power going to the motor as the battery dies so that there is still power to the flight controller & servos so you can make a dead stick landing. Now in the case of a quad, no power to the motors means you are just dead but that is beside the point. The BEC is how we power the rest of the systems. 3) The receiver can be powered from the flight controller or from another BEC. I have opted for just take the power from the flight controller at the moment. Depending on what other toys you want to put in here like video transmitter for FPV etc, the power distribution options will change. So that is that but we still need to run the motors so time to get back on track. 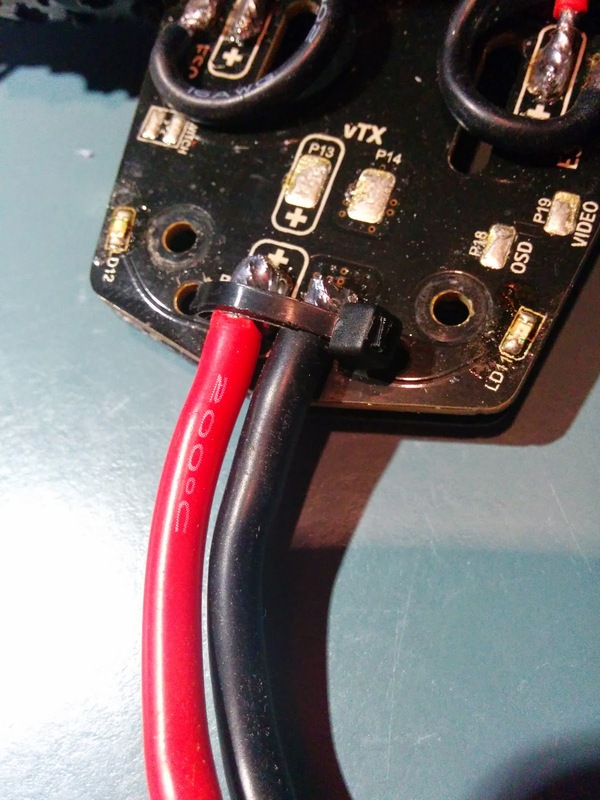 Fortunately the power leads for the ESCs have nice little bayonet type connectors on them that also just happen to fit the XT-60 connectors on my battery packs. To make things safe and to prevent motors from dancing on my table I screwed them all to the frame. The position was not important as I was going to remove them for the final step of soldering the ESC to the power distribution board anyhow. Finally, NO PROPS. They look cool but when you start playing with Baseflight and motors, stuff happens and you don't need props to introduce blood into the system. Anyhow, I didn't photograph it but trust me when I say, connecting the input side of the ESC directly to the battery (correct polarity please) and then connecting the BEC lead from the ESC to port 1 on the Naze32 (Check your polarity or the magic smoke will escape) will allow you to run that motor using the Baseflight tool. In the case of the BEC line on my Afro 20A ESC, yellow is the signal line, red is power and brown is ground. I imagine this is standard but just make sure when you connect it to the Naze, the brown is on the connector closest to the edge of the board and the signal is on the connector furthest from the edge of the board and check again each time you connect and re-connect the motors. So, Motor 1, connected and ready. Connect the Naze to your PC with the USB cable and we are ready to go. Head over to the "Motor Testing" tab and select the "Check" checkbox. If you move the slider for motor 1, the motor connected to channel 1 on the Naze should now spin up. Reduce the slider until you can see the direction of rotation or take note of it as it spins to a stop. Job done. Mark that motor as CW or CWW. Power it all down and repeat with motors 2,3 & 4. Next post, soldering the ESCs and final set up. In the second part of the build log I am going to run through the radio gear and other bits before getting into the meat of the build. It probably sounds pretty obvious but if you can finalize your shopping list all at once then you are going to save a lot of postage charges. The joy of owning a real RC transmitter with a thousand buttons is that you own this big chunk of radio gear with a thousand buttons. I went for the FrSky Taranis DX9. As luck would have it they had just released a new model making for a well timed price drop on this particular model. For my level of skill and intended use, I was never going to know what I was missing from the new one so took the savings and ran. The Taranis is a 2.4 Ghz, 16 channel radio and uses the Open TX opens source software. It is not a turn on and go sort of radio. You have to program everything you want it to do which fit the bill for this project. More to learn on the go is a good thing in my books. For that small inconvenience you get a whole lot of flexibility in how you set it up and also allowing it to work with receivers from other brands as well as just the FrSky gear. The final bonus is that it is arguably as much if not more transmitter than a Spektrum or Futaba while being half the price or better. This was momentarily the most confusing part of the purchase list. I went for the FrSky D4R-II 4ch 2.4Ghz receiver that also includes telemetry. The confusion was that I had to get my head around CPPM mode and how a four channel receiver actually becomes an eight channel receiver that pipes everything over one wire rather than one wire per channel. Just to confuse things more, it seems it probably needs to be flashed with new firmware to make the eight channels work properly because of problems with the CPPM frame being too short at 18ms resulting in data loss. The updated firmware makes the CPPM frame 27ms long so as I understand it, it has time to get all 8 channels of information over the line. Head spinning yet? Yeah, I'm learning a lot more than I expected too! Needless to say I have not got around to flashing anything but have it working CPPM mode and hope that since I am not using all 8 channels at this time that I can avoid issues while I read and learn more. If not I can blame any crashes on the receiver and me going to full throw on everything at once. 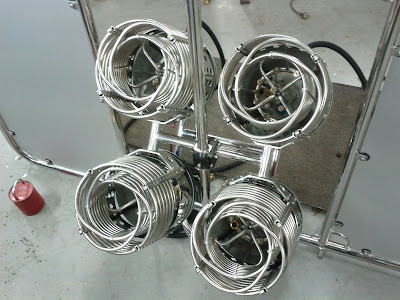 The final piece of the puzzle is to do with leads and connectors. One thing you need to identify is the connector on your battery packs as that will determine what you need on the quad end of things to get the power into it. The batteries I bought use the XT60 connector so a pack of Male XT60 connectors was first on the list. Now while the receiver comes with a nice little harness of wires and plugs, it is not really what I needed since I was going to use the CPPM to link the FC and receiver. All I needed was a single 3 core servo wire for power, ground and signal. I also needed a two wire connector for the buzzer, another for the telemetry and a third for sending power to the flight controller for voltage sensing in the telemetry. The crazy thing is, I thing is I can't seem to find what these little connectors are called and it seems even harder to find a double version as is needed in various places on the Naze32 flight controller. The solution is to buy a pack of Male to Male servo extension leads and cut them in half to give you two connectors. You can then remove the wire you don't want, solder them on where needed and even trim the connector down too if needed with a nice sharp knife. More details on that soon but safe to say a 5 pack of 150 or 200mm extensions will get you out of trouble. Some other items in your shopping list will include heatshrink of various sizes - I used 3mm for my wiring and 20mm clear for my ESCs and some liquid electrical tape, solder and a good soldering iron. The piezo buzzer was bought at Jaycar and was a generic surface mount buzzer that will handle 3 to 15volts. 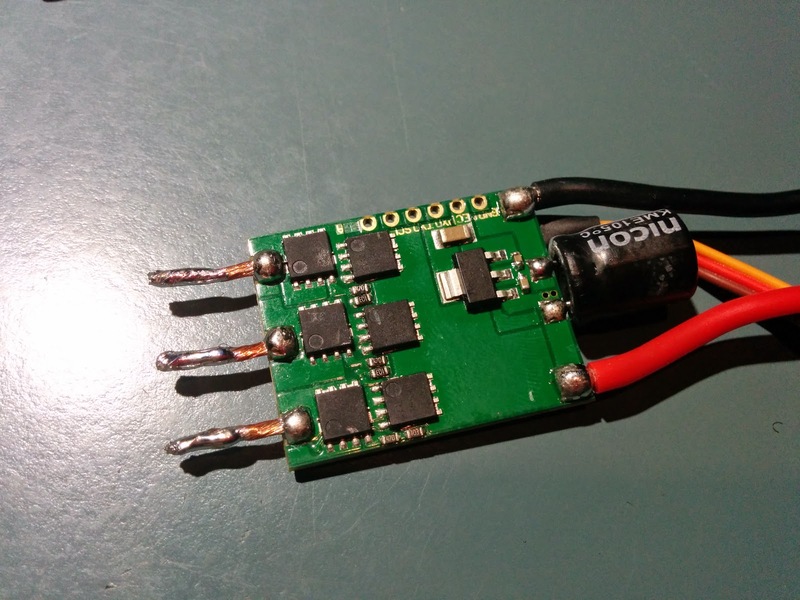 I soldered this onto one of the butchered servo leads as detailed later. The final cool thing are Rapstraps. You can use regular cable ties but the Rapstraps have some stretch making them a nicer way to secure things and they can be undone and re-used easily if needed. It has been a long time since I have played with RC planes and decided that it was time to check out the drone game before it all gets banned, legislated against or relegated to the past by the fun police. After looking at the options including just buying one off the shelf I decided it would be more fun to do the build more or less from scratch and learn how the insides work. With a lot of sneaky work on Google, a few Gb in youTube videos and a flight of a DJI Phantom 2 I finally decided to go down the path of a mini quad. The final selling point was that it would be good for first person view flight (FPV) and in the words of Justin Galbraith, would be like proximity flying in a wing suit without the risk of death. You know you are getting old and semi responsible (read lazy) when you opt for a 220mm wide quad copter rather than allocating 10 years to skydiving and base jumping experience. Anyhow, this is what I bought straight up to get this party started. When buying the frame, I also bought a few spares for a crash kit including nylon screws and spacers. The extra props were also to make sure I had spares as all evidence suggested that crashes are common and props are the first to die. More on that later. I also already had a good charger on hand for the LiPo batteries but have also added a cell balancer and parallel charging board so I can charge more than one battery at once and also ensure they remain healthy. Pretty much everything here can be found at various model shops but from Australia, this was the beptions on price I could find. First up I have to thank Justin Galbraith for his input into this shopping list. He flys both a MiniH and a MiniX quad from Blackout so had a good insight into the set up that people are using and what works. The list is also pretty close to the suggested equipment list on the Blackout website. The Blackout MiniH Quad is a 220mm H shaped quad copter, precision cut from carbon fiber sheet with a power distribution board and LEDs built in. The majority of fasteners are M3 nylon screws so that in the event of a crash, cheap screws sheer off and protect the more expensive bits of the frame. In theory, in all but the most violent of crashes, a couple of props and screws later and you will be back flying. I can already confirm that the design works as advertised. The Afroflight Naze32 Acro is the basic version of the Naze32 Funfly without the magnetometer (compass) and barometer. The acro version can control the quad (and other multirotor designs) without having the more fancy features like altitude hold and direction hold. I understand it can be hooked up to a GPS but without the magnetometer and barometer it will struggle for useful accuracy. The amazing thing here is that the whole Naze32 Acro package is only 36mm square and $27.00. For that price you get the board with a bag of connectors that you need to solder on yourself so it is not the best place to start if you have not held a soldering iron before. The speed controllers take inputs from the flight controller and tell the motors how fast to turn. As such there is one ESC per motor. The ESC is a reasonably complicated little computer with on board software (firmware) to allow it to do it's job. As such when buying them, there are a number of ESCs that are already programmed for use in multirotors. 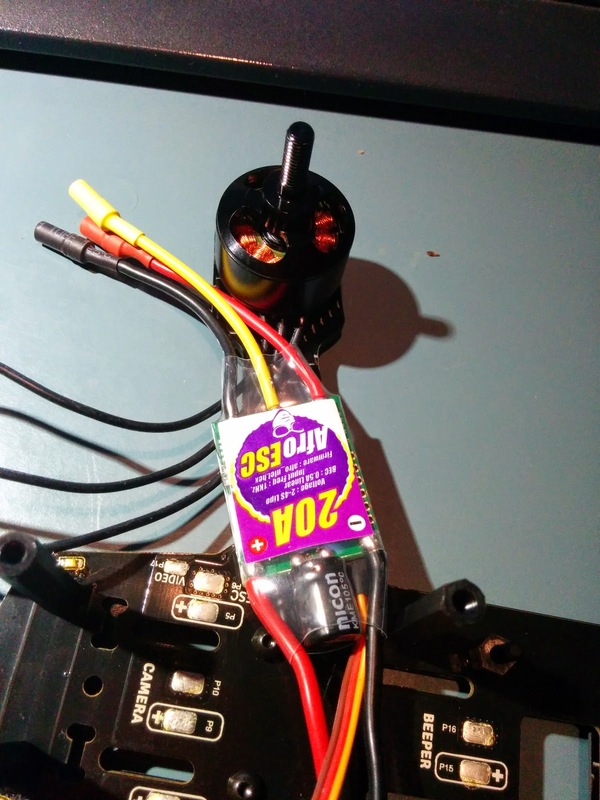 If you get a standard ESC that would be used in an RC plane for example then you will have to learn about flashing firmware that will allow it to work properly with a mutlirotor. The suggested ESCs for this quad are 12amp but I have gone for a larger 20amp ESC so that I can either move them to a larger quad down the track or if I upgrade the frame arms to the larger 6" arms I can go for bigger motors/props. The Afro HV 20A multi rotor ESC is supplied with the SimonK firmware for multirotors and can handle up to an 8 Cell LiPo. In hindsight, I probably should have just gone with 12amp ESCs as this quad will never have more than a 4 cell battery and I will probably just buy new gear for a new quad if I go that way down the track. It is all evolving so fast and is relatively cheap so who knows what will be available in a month or two. These were purchased direct from Blackout as most people did not have them in stock. The Cobra motors are well regarded for their performance and reliability and are half the price of the next best option. They use a M3 mounting screw however the supplied screws are too short to use with the 3mm thick arms on the MiniH quad frame. 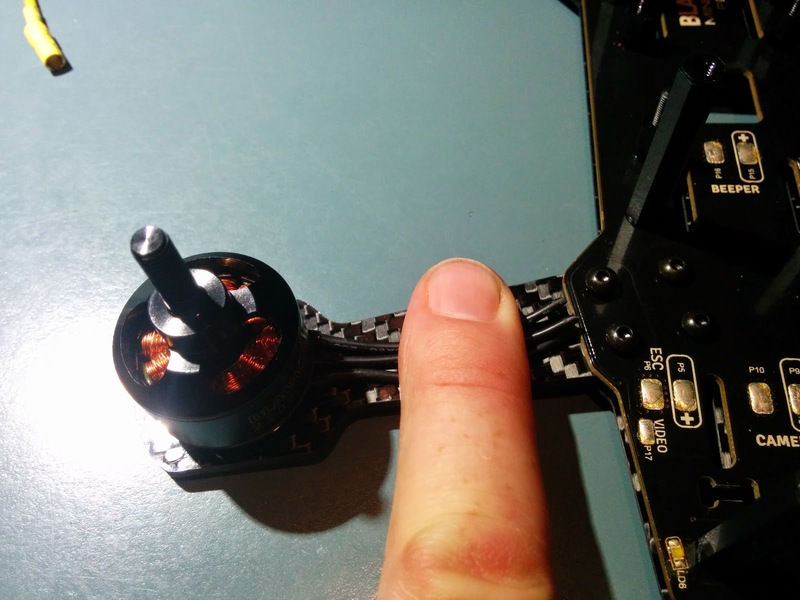 You will need to buy or acquire some M3 x 6mm screws so you can fit the motors. The other quirk is that the arms have spacing for the M3 screws at 19mm pitch which will only allow two screws per motor. It seems to work fine. If you really want to use all four screws per motor then you will need to drill the extra two holes in the frame. Finally, they come with nylock nuts for the prop shaft which is nice in a multirotor where the opposite rotation of two motors can cause a regular spinner to well, spin off! The Gemfan 5030 props are matched well to the motors, are dirt cheap and as big as you can fit on this quad in the 5" short arm configuration. They come in packs of four with two clockwise and two counter clockwise blades. Because I am starting flying visually, I have split the colours and put green on the front motors and black on the back to help with visibility and orientation. I was warned that I would trash the props and I have now gone and bought a massive bag of 100 props to keep my flying adventurous and not be too worried about a prang taking me out of the air for a week while waiting for spares. I can confirm that trees, doors, chairs, carpet, long grass and the Kavanagh Balloons factory building will all chew the props up really quick. I knew very little about high performance LiPo batteries other than they are great for starting house fires if you are not careful when charging them. I still have a lot to learn in this area so in the end I went for the Turnigy nano-tech 1300mAh 3S 45~90C Lipo Packs for no other reason that it was what was suggested by Justin. I could probably have gone for a lower discharge rating than the 45~90C but the higher the C rating (in this case 45 average/90 peak) the less chance of damaging your batteries by asking too much of them. Like many other people, Facebook, Twitter and Google+ have changed my interaction with the web and taken me away from this here outlet. Life has been shortened to 140 characters or smart arse comments of little import on Crackbook. So what have I done in the last two years since posting here? Well I still dance and compete and have done okay at Masters/Champions level in the Modern Jive/Ceroc world. The cabaret routines choreographed and performed by Charlie and myself have placed well and seem to be enjoyed by people. We have travelled around the country teaching and having fun. The big news is my engagement to the wonderful Indigo who was not even on my radar when I last posted here! This is her for those that don't know. Obviously this is a pretty amazing time and there is more fun stuff to come. Work wise, it has been nuts with more product development. I have designed a new racer, the EX-60 which is the little brother to the original EX-65. It is not only smaller but has a new profile shape. The biggest thing though is the development of the new Crossfire burner. The running joke has been that this burner has been in development for over 20 years but it is here now and is everything we had hoped it would be. Doubles, triples and quads are running out the door and everyone who has flown with them is very excited. I just did a quick trip to Cairns for the inaugural flight by Raging Thunder with their new Quads and to do a maintenance training course on the new burner for their staff and staff from Hot Air. August will see me tripping off the Battle Creek in Michigan USA for the 2012 World Ballooning Championship where I will crew for Andrew Robertson. It is going to be a fun week on the crew side of the basket so expect lots of photos and fun stories as that all unfolds. A little training weekend was had up in Canowindra on the 7th and 8th of July with the Australian team. Lots of fun was with task flying and catching up on the social side of flying which has not really been on my agenda in the past year or two. It was fun to be back flying with friends and not have it feel like work. With a bit of luck I will even get around to doing some competition myself some day soon! A penny dropped for me last week. A light switched on. I am sure there is other cliché that I could use but I will save you the pain. Over the last two years a change has occurred in my life. My focus has shifted from all things flying towards all things dancing. It is an odd feeling to say the least. Dance is not something that I ever saw as a part of my life - I got dragged kicking and screaming into it only a handful of years back and once my eyes were opened I found it was something I needed. Dance definitely gives me my fix of competition and challenge and does so in a more compact and convenient way than flying balloons ever did. I still love our business and even flying still makes me smile inside once I am doing it but right now I don't ever wake up wishing I could go for a flight. I wake up wishing I could go for a dance instead. Modern Jive or Ceroc is where I started in the dancing world. 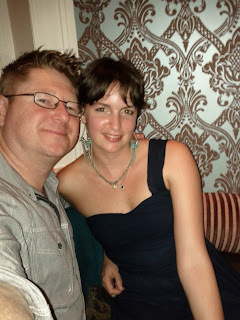 It is easy to pick up, very social and fun partner dance that can be done to just about any music. Since then I have started expanding and playing with West Coast Swing. A more technical dance in some respects but oh so much fun to play with once it starts to click into place. I am not there yet but every now and then there will be a moment where I get a taste of what it is about and it just blows my mind. It is a smooth and connected dance that is all about lead and follow and playing with the music and your partner. So, the moment last week was bought about by two very special people. 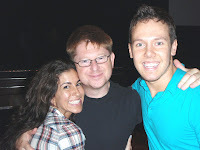 Benji Schwimmer and Kellese Key who were teaching at an event put on by Nuroc Dance Company. Benji is the winner of So You Think You Can Dance, USA season 2. Kellese is his dance partner and they were out here teaching WCS workshops for a week and doing private lessons. There were too many moments, laughs and highlights to touch on except to say that I finally can see myself as a dancer and know that this is a part of my life for ever. These guys made that connection for me, made me realise just how important this is to me. It was amazing to watch them dance, talk and express themselves and the obvious part that dance has played in their lives. Charlie and I belted out our 2009 Bond routine one last time to get yet another trophy and best of all, the peoples choice award for it. Not a bad way to wrap it up before we start work on this years competitive routine. As for ballooning stuff, we wrapped up 2009 with our first ever special shape balloon. From go to woe it was my baby to design, certify and test fly. It was quite a challenge but good fun. Even better fun because it just worked and is still out there working away, doing it's thing with not so much as a phone call or question from the customer. The only thing I like more than sending a new balloon out the door, is never seeing it again until it has died of old age and the customer rings saying they would like another please! It has been an interesting week for me. This is the first Aussie Ballooning Nationals that I have missed since 1994. I really needed a break after the Worlds in Austria last year and so, here I am watching the results on the internet and having to admit I am wishing I was there. It looks like they are having great weather and lots of tasks. Paul is running away with the competition with Edwin close behind. It would have been fun to be in that fight. Andrew Robertson is flying my racer this week. Giving my balloon away was one sure way of making sure I could not get suckered into going at the last moment. Having said that I have been dancing like a freak for the past year and have not had any time for ballooning so I would have been under prepared and out of practice. It was probably better to leave it to those more keen. On the dance front, Charlie and I have won both of the major Aussie modern Jive (Ceroc) comps at advanced level and placed 3rd in NZ. We also have a routine we choreographed together that has placed 3rd a couple of times now too. Very happy with that result. With one more major comp to go this year we are working hard to make it a clean sweep before we are bumped up into Masters for the 2010 competitions. This is a Flickr badge showing public photos from seankav. Make your own badge here.